Wrought Iron Doors provide all-weather strength and classic beauty at the same time. The good thing about it is it can be customized as well. While it is currently the trend, wrought iron material has actually been used in decorating home interiors, buildings and landscapes for many centuries now. 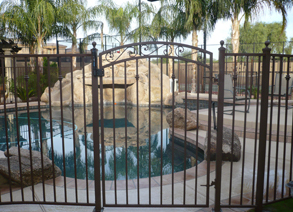 Being the favorite metal in today's construction and architectural industry, wrought iron is used for a quite a number of things - from doors, to bed frames, to chairs, to park benches, to many other pieces of furniture and landscaping accessories. The door is the heart of the home. It is the focal point of the house's exterior and the gateway to the interior. Therefore, it should say much about the house. Not only does the door affect the look of the home, it is also the barrier that protects the home from the outside environment and intruders. Thus, the door should be strong, weather proof, and tamper resistant. While wood often provides a good quality door for a house, it is also important to consider other options before making a choice for your home entryway. Think of using an iron door for your home entry. 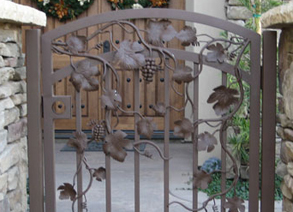 Wrought iron is an excellent material when it comes to protection, durability, and appearance. Exterior doors are exposed to numerous natural elements such as rain, ice, and hail. In most cases, an iron door is sealed and coated in special materials and primers in order to prevent weather damage and rusting. 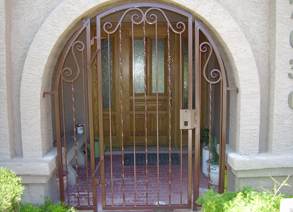 The properties of iron help make a wrought iron door resistant to rotting, splintering, and cracking. Therefore, these doors outlast doors made of other materials and go years longer without replacing.